Lahore: The main round of the SNGPL Pakistan International Squash Circuit commenced at the Punjab Squash Complex, today (Wednesday – 27th June). On Thursday, the quarterfinals of men and women events will be contested. The major upset was when 10th seed player – Kashif Asif (Pak) stunned the 2nd seed Israr Ahmad (Pak). Kashif, who was wildcard holder in the tournament, started the match exceptionally well and put Israr under tremendous pressure right from the start. Kashif won the first game 11/8, but Israr then utilized his vast experience to take the second game 11/9. Kashif once again played superb squash and won the third game 11/9 before losing the fourth one 11/3. In the fifth and decisive game, it was Kashif who displayed prevailed over Israr and won the game 11/6 to register an upset and well-deserving victory in 49-minutes battle. 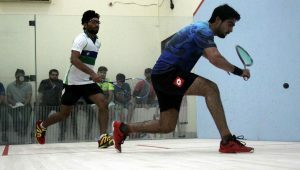 In other matches of the Men’s main round all the seeded players registered victories except Danish Atlas Khan, who was once among top seeds and returned Pakistan squash after a long gap. Another top Pakistani player Farhan Zaman (PAK) had to struggle hard to beat Zahir Shah (Pak) 4/11, 12/10, 11/8, 11/4 in 34 minutes. Tayyab Aslam (Pak) edged past Khawaja Adil Maqbool (Pak) 11/4, 11/4, 11/8 in 18 minutes. Asim Khan (Pak) defeated Waqar Mehboob (Pak) 12/10, 0/11, 11/9, 11/5 in 39 minutes. Syed Azlan Amjad (Pak) routed Umair Zaman (Pak) 11/9, 11/7, 11/8 in 23 minutes. Amaad Fareed (Pak) faced tough resistance from Ali Bukhari (Pak) before winning the encounter by 11/9, 11/2, 9/11, 9/11, 11/5 in 51 minutes. Ahsan Ayyaz (Pak) proved too tough for Danish Atlas Khan (Pak), who had high aims of becoming one of the Pakistan team members and help in win the international medals, but his dreams were dashed by spirited Asim Khan who outlasted Danish by 11/9, 10/12, 11/6, 11/8 in the 68 –minute marathon match. 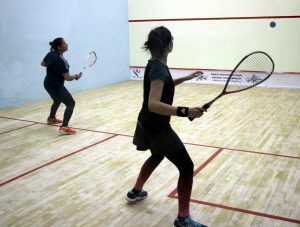 In the Senior Women main round, all the seeded players advanced to the next round after displaying quality squash skills and finest techniques. It was only Madina Zafar, who was unseeded player and won her encounter against Noor-Ain-Ijaz with a score of 11/6, 11/5, 11/3 in just 11 minutes. Saima Shaukat (Pak) played well against Amna Fayyaz (Pak) and defeated her by 11/6, 11/8, 5/11, 5/11, 11/9 in 30 minutes. Noor Ul Huda (Pak) outsmarted Aiman Shahbaz (Pak) by 11/8, 11/5, 12/10 in 11 minutes. Faiza Zafar (Pak) downed Komal Khan (Pak) by 11/3, 6/11, 11/4, 11/1 in 21 minutes. Zahab Khan (Pak) overpowered Sibgha Arshad (Pak) by 11/5, 11/7, 11/8 in 20 minutes. Another top player of women squash, Riffat Khan (Pak) proved too good for Anam Mustafa Aziz (Pak) as she took just 14 minutes to overwhelm her opponent by 11/8, 11/0, 11/5. Another spirited player Zoya Khalid (Pak) also displayed quality squash and outclassed Muqaddas Javed (Pak) by 11/6, 11/6, 11/2 in just 16 minutes.